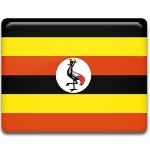 Independence Day is one of the major national holidays in Uganda. It's annually celebrated on October 9 on the anniversary of gaining of independence from Great Britain in 1962. The first British appeared on the territory of Uganda in the 1860s, when the British explorers started search for the source of the Nile. In 1888 Uganda was placed under the charter of the British East Africa Company and became British protectorate in 1894. The process of decolonization started after the end of World War II. Numerous political parties started emerging during the second half of the 1950s. Uganda was granted home rule on March 1, 1962. The first elections to the Uganda Legislative Council were held in April and on October 9 Uganda gained total independence from Great Britain. This anniversary is annually observed across all cities of Uganda. Various events and activities are organized to unite the nation of Uganda. Festive events organized at the capital of Uganda are attended by President and heads of other African countries.